Freshman Ryley Howard’s impressive start to her collegiate career continued at the Mountain Dew Invitational. The Arlington, Virginia, native finished with a time of 18:32 in the 5K, notching the 10th fastest 5k time in Hurricanes history. Anne den Otter, Abby Kettle, Olivia Raymond and Emma Langloris all finished with season-bests at the event. For the third straight meet, Dylan Sykes led the men’s side. The sophomore recorded a time of 25:39, dropping more than three minutes of his 8K time. Junior Matthew Wifels and freshmen James Hasell and Sam Flesichman, each closed out the event with season-highs in the 8K. Miami’s next competition will be at the USF Invitational Oct. 12 in Tampa, Florida. The Hurricanes dropped a pair of Atlantic Coast Conference matches 2-0 against Duke and Virginia Tech at Cobb Stadium. 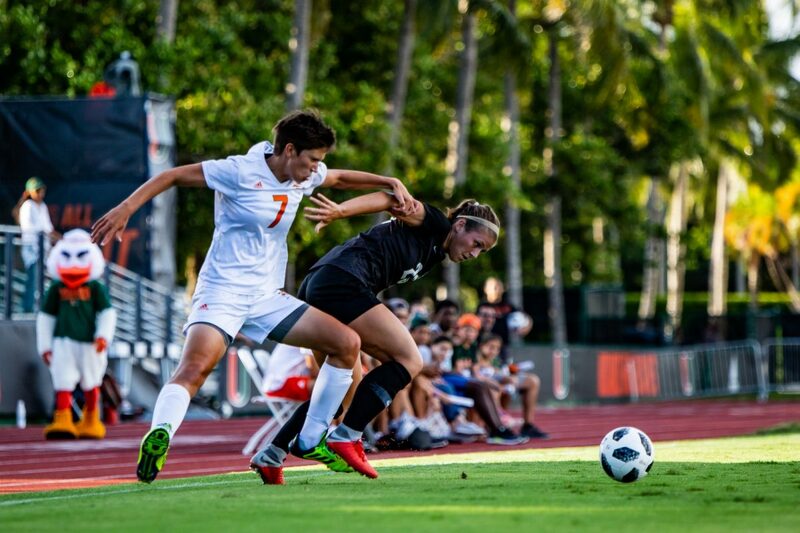 Against the Blue Devils on Thursday night, Miami held the 12th-ranked team in the country scoreless for the first 43 minutes of action, but a late first half goal put Duke up, 1-0. In the 59th minute, the Blue Devils doubled their lead. Duke’s Karlie Paschall boomed a ball over the top of Miami’s defense towards Taylor Racippi, who curled the ball into the right corner of the net. 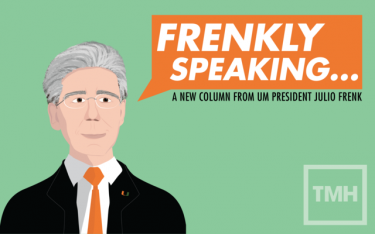 On Sunday afternoon, against the Hokies, Virginia Tech stormed out to an early advantage. Allyson Brown streaked towards the box and found the back of the net to put VT in front, 1-0. Virginia Tech increase its lead seven minutes into the second half when Emmalee McCarter sent a cross near the far left post and Emily Gray headed it home to give the Hokies a 2-0 lead. 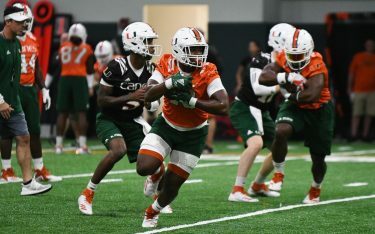 The Hurricanes will look to end their three-game losing skid and pick up their first conference victory when Miami hosts Syracuse 7 p.m. Sept. 29 at Cobb Stadium. Estela Perez-Somaribba defeated Pepperdine’s Evgeniya Levashova, 6-4, 6-3, to win the elite Oracle ITA Masters Sunday at the Malibu Racquet Club. The No. 3-ranked Perez-Somarriba picked up five straight set victories to win the four-day, 32-player tournament. Back in Coral Gables, Florida, the Hurricanes finished the Miami Fall Invite with a 13-7 record. Yuna Ito and Ana Madcur were named co-champions of the B Main Draw. In the semifinals, Ito picked up a 6-3, 6-3 victory over Bella Lorenzini and Madcur registered a 6-3, 6-3 win against Lera Patiuk setting up the all-Miami final. Miami’s doubles teams dropped their matches earlier in day. The pair of Lucia Marzal and Daniella Roldon lost, 4-6, to Florida’s Katie Kubicz and Marlee Zein in the B Main Draw third-place match. Ito and Ulyana Shirkova surrendered a 3-0 lead to fall 7-6 (7-3) to Ole Miss’ Tea Jandric and Sabina Machalova. UM will host its final home tournament of the fall slate Oct. 12-14 at the Neil Schiff Tennis Center in competition for the Bedford Cup. Miami won back-to-back ACC matches against Wake Forest and Duke this past weekend at the James L. Knight Sports Complex. On Friday evening, the Hurricanes opened up conference play with a 3-0 (25-17, 25-18, 25-14) victory against the Demon Deacons. Outside hitters Chloe Brown, Kolby Bird and Elizaveta Lukianova all finished with a team-high 10 kills. Fifth-year senior setter Haley Templeton notched 30 assists to help Miami record an efficient .341 hitting percentage. 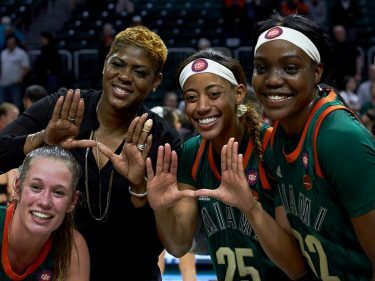 Less than 48 hours later, the Hurricanes extended their winning streak to four games with a 3-1 (25-23, 23-25, 25-23, 25-23) win over Duke in front of a season-high attendance of 980 fans. Bird led the Canes offense with a season-high 17 kills and two service aces. Lukianova chipped in 15 kills and Brown notched another double-digit kill performance with 11. Miami will look to stay undefeated in conference action when the Hurricanes travel to play Pittsburgh 7 p.m. Sept. 28 at the Fitzgerald Field House.